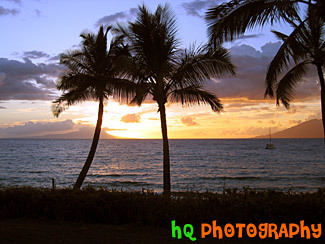 A picture of a beautiful sunset taking place in Maui, Hawaii. In this photo you can see the silouettes of three palm trees and a boat in the distance in the Pacific Ocean. The pretty colors of the sunset can be seen reflecting in the Pacific Ocean.